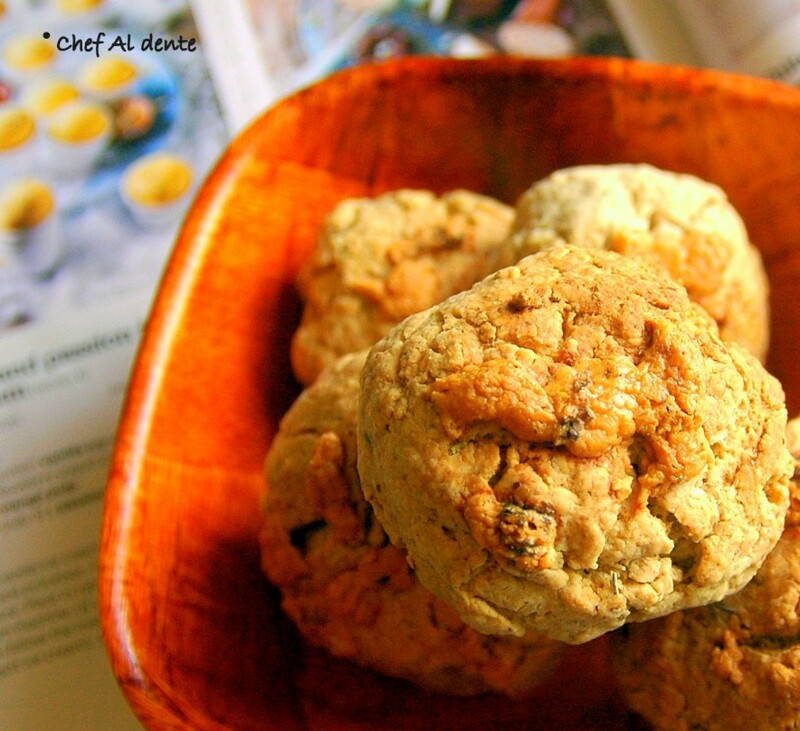 Chef Al dente: Blue Cheese Scones with Rosemary! Blue Cheese Scones with Rosemary! I bought a pack of blue cheese few weeks back just to know what blue cheese tasted like. But I was not sure what I could use it for. Recently I decided to make scones and I thought can I use Blue Cheese for scones?? I just typed Blue Cheese scones in Google and was surprised at the various recipes that came up for blue cheese in scones! So then without wasting any time I went ahead and tried making these delicious, flaky, cheesy scones - my base was this recipe from the brand Castello; they produce blue cheese. Blue Cheese gets its name from the blue veins produced by injecting cultures of fungi / bacterium like Pencilium while manufacturing these cheese. This tends to give it a strong flavour unlike normal cheese; which is what sets them apart. Mix the dry ingredients i.e. flour, oats, flax, baking powder, baking soda, sugar, salt and rosemary with a wire whisk. Then rub in the cold butter and three fourths of the blue cheese (crumbled) into the flour to form a coarse mixture. Use your finger tips or you can also use a fork. When you have a good crumbly flour mixture add very small amounts of milk to form a crumbly dough. You need to be careful so as not to over do it. The dough would be more like a cookie dough. Divide into small balls (the size of your palm) and then place them on a baking tray. Sprinkle remaining blue cheese on top of each dough ball and bake for around 20 to 30 minutes till they are cooked and the surface is golden brown. Serve warm. Very delicious n yummy scones..adding rosemary is a unique flavor!!! Perfectly baked scone. Inviting clicks. I have never tried savory scones, but I think I love them already, these sound perfect!